Ok, we've reached 300 followers and the product up for grabs this time is gonna keep those brows lookin "so krispy" (remember that song? Lol. You know you do!). 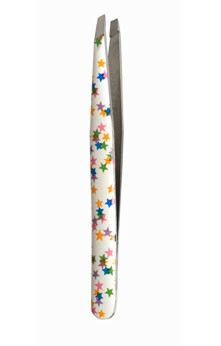 This giveaway is sponsored by LaForce + Stevens to win a pair of Japonesque Artisan Slant Tip Tweezers. Enter to win this pair pictured. What a cute design, right? Check out my review on them to read my thoughts about it. * Simply leave a comment saying "Enter Me"
A winner will be randomly selected using www.random.org and announced that Saturday. Make sure you check back on Saturday to see who the winner is b/c if you don't (email me to) claim your prize by Monday, I'll randomly select another winner. Good luck! And, I'm following the blog (in my google reader). And congratulations for reaching 300 followers! Enter me please. I follow. I have gotten so much "Hairspiration" from your blog :-D thank you! Enter me. Wow, that's easy!! enter me! especially since i claimed that 300th follower mark, lol.